Take a page out of the Irish's playbook by marinating flank steak in a stout beer, such as Guinness, before throwing it on the grill. 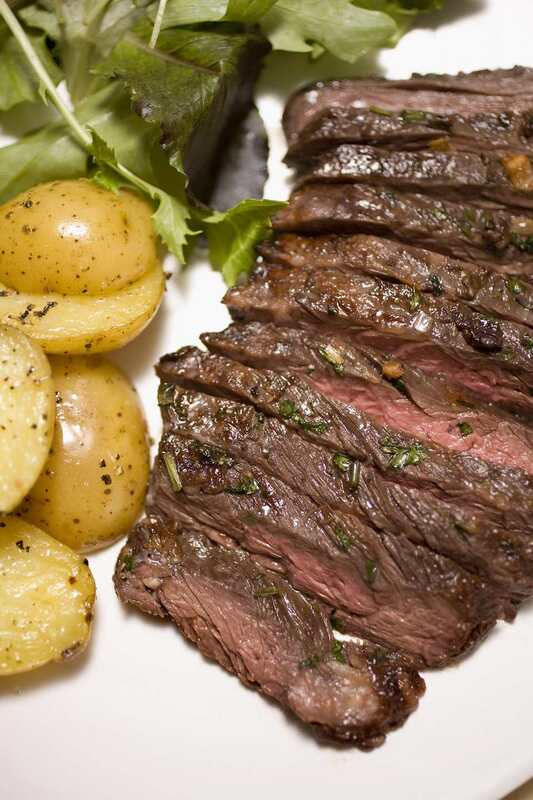 Flank steak comes from, as the name suggests, the cow's flank. It's incredibly lean, so the cut of meat does best when it's braised in liquid to tenderize or marinated and then grilled quickly over high heat. Flank steak isn't a particularly expensive cut of meat, making it a good option for a budget-friendly weeknight dinner or a cookout in which you're preparing beef for a big group of people. It's also a thin cut of meat, which means that it grills quickly—a blessing when you're feeding a lot of hungry people! This particular recipe calls for marinating the flank steak in stout beer, which adds flavor to the meat. Don't worry—the beer, which is already fairly low in alcohol compared to wine or spirits, most evaporates during the cooking process. In a large plastic zip-top bag or plastic container with a tight lid, combine the steak, Dijon mustard, garlic, Guinness, salt, and pepper. Close the bag or container and shake it well to evenly distribute the marinade. Put the marinating steak in the refrigerator for 2 hours. Remove the steak from the fridge and let it come to room temperature while you prepare the grill. Set the grill to high heat, or about 450 degrees F.
Grill the steak for 4 to 5 minutes for each side, double-checking the internal temperature with an internal meat thermometer. Remove the steak from the grill, and let it rest for 5 to 10 minutes before serving. Use an instant-read meat thermometer while grilling the steak. Cook the steak to 125 degrees F for rare, 135 degrees F for medium-rare, or 145 degrees for medium doneness. Because flank steak is so lean, don't cook it above medium doneness. If you plan to cut the steak into strips for serving, slice it against the grain. This means cut it perpendicular to the long strands of muscle that's visible on the beef. Although flank steak can withstand marinade for longer than 2 hours, it might turn the meat a strange grayish color. While it's still safe to eat, the steak might not look as appetizing as beef that has been marinated for less time. Don't skip the resting period for the steak. These extra few minutes allow the juices within the beef to redistribute, ensuring that every bite is as juicy as the next.